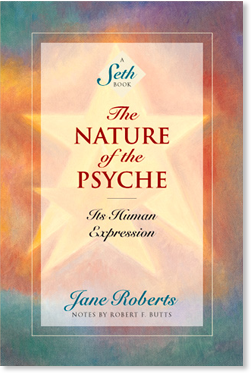 The Nature of the Psyche (eBook) - Amber-Allen Publishing, Inc.
Seth, speaking exclusively through Jane Roberts, reveals a startling new concept of self, answering questions about the secret language of love, human sexuality, our inner reality that exists apart from time, the real origins and incredible powers of dreams, and how we choose our physical death — sometimes years in advance. For the first time Seth explains: Why love is the basic language from which all others spring; the bisexual nature of humanity and its biological and spiritual importance; the true basis of homosexuality and lesbianism — along with their private and social effects; the benefits of recalling our dreams and consciously participating in them; how dreams can prevent chronic illnesses by providing important therapeutic information; simple exercises you can do to expand your awareness of the deeper portions of your psyche and stretch your abilities to their fullest potential. You come into the condition you call life, and pass out of it. In between you encounter a lifetime. Suspended — or so it certainly seems — between birth and death, you wonder at the nature of your own being. You search your experience and study official histories of the past, hoping to find there clues as to the nature of your own reality. Your life seems synonymous with your consciousness. Therefore it appears that your knowledge of yourself grows gradually, as your self-consciousness develops from your birth. It appears, furthermore, that your consciousness will meet a death beyond which your self-consciousness will not survive. You may think longingly and with an almost hopeful nostalgia of the religion of your childhood, and remember a system of belief that ensured you of immortality. Yet most of you, my readers, yearn for some private and intimate assurances, and seek for some inner certainty that your own individuality is not curtly dismissed at death. Each person knows intuitively that his or her own experiences somehow matter, and that there is a meaning, however obscured, that connects the individual with a greater creative pattern. Each person senses now and then a private purpose, and yet many are filled with frustration because that inner goal is not consciously known or clearly apprehended. When you were a child you knew you were growing toward an adulthood. You were sustained by the belief in projected abilities – that is, you took it for granted that you were in the process of learning and growing. No matter what happened to you, you lived in a kind of rarefied psychic air, in which your being was charged and glowing. You knew you were in a state of becoming. The world, in those terms, is also in a state of becoming. On occasion, definite physical cures happen in the dream state, even though you may think that you are intellectual and knowing when you are awake, and ignorant or half-insane in your dreams. If you were that “dumb” in the waking state, then you would be in far better health. In such dreams you tune in to other frequencies that are, indeed, closer to your biological integrity, but there is no reason why you cannot do so in the waking state. When such seeming miracles occur, it is because you have transcended your usual official beliefs about your body and its health, and disease, and so allowed nature to take its course. Often in the dream state you become truly awake, and grab ahold of your spirithood and creaturehood with both hands, so to speak, understanding that each has a far greater reality then you have been led to suppose. More often, however, there are instead only blurred glimpses and tantalizing views of a more expansive kind of experience. To make matters more confusing you may automatically try to interpret the dream events according to your usual picture of reality, and switch channels, so to speak, as you waken. Suppose that you turned on your television set to watch a program, for example, and found that through some malfunction a massive bleed-through had occurred so that several programs were scrambled, and yet appeared at once, seemingly without rhyme or reason. No theme would be apparent. Some of the characters might be familiar, and others, not. A man dressed as an astronaut might be riding a horse, chasing the Indians, while an Indian chief piloted an aircraft. If all of this was transposed over the program that you expected, you would indeed think that nothing made any sense. Each character, however, or portion of a scene, would represent in fragmented form another quite valid program [or reality]. In the dream state, then, you are sometimes aware of too many stations. When you try to make them fit into your recognized picture of reality, they may seem chaotic. There are ways to bring the picture into focus: There are ways to tune into those other quite-natural frequencies, so that they present you with a more expansive view both of the world as you define it, and of its greater aspects. The psyche is not encased, in your case, within a frame too fragile to express it. Only your beliefs about the psyche and about the body limit your experience to its present degree.